HISD is currently accepting applications for its 2019 Summer Student Leadership Program, a six-week paid summer internship and leadership development program for HISD high school students and alumni currently enrolled in college. In line with HISD’s mission to provide students with the tools to reach their full potential, the program addresses the need to expose students to fulfilling careers and skills employers demand in a rapidly changing world. Participants will gain valuable employment experience and have the opportunity to test-drive career pathways before choosing a college major or entering the workforce. This entry was posted in Career/technical education (CTE), College Readiness, High Schools, News, Summer programs and tagged Summer Student Leadership Program on April 4, 2019 by HISD Communications. The event will take place from 10 a.m. until 1 p.m., Saturday, March 23 at the Hattie Mae White Educational Support Center (4400 W. 18th Street, 77092). Students will have the opportunity to talk with local employers about future careers and compete in various competitions in subjects such as cosmetology, movie making, construction, and culinary skills. 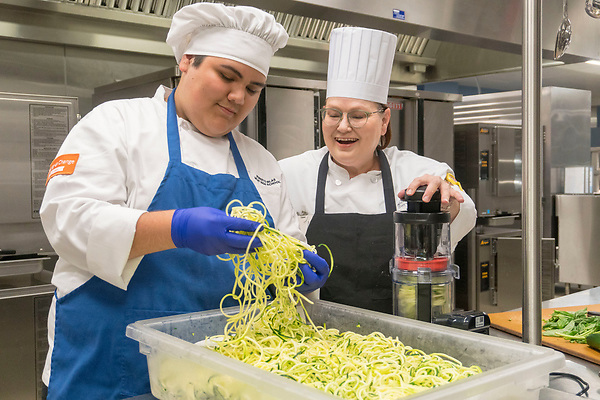 This entry was posted in Career/technical education (CTE), News on February 25, 2019 by HISD Communications. As livestock show season picks up steam, Chavez High School Junior Jewels Hernandez is ready for her first time in the major show ring. In just her first year with Chavez’s Future Farmers of America (FFA) program, Hernandez has already had considerable success showing her Simbrah heifer, which is something she has long wanted to try. This entry was posted in Career/technical education (CTE), News on February 7, 2019 by HISD Communications. The Houston Independent School District, the University of Houston-Downtown, Houston Community College, and the Port of Houston Authority joined forces Thursday to announce a new education partnership that prepares students for maritime careers. Interim Superintendent Grenita Lathan, UHD President Juan Sanchez Munoz, Port of Houston Authority Chair Janiece Longoria and HCC Vice Chancellor of Finance and Administration Janet Wormack each signed a Letter of Intent that outlines a seamless career pathway for students that begins in high school, extends to higher education institutions, and ultimately leads to potential maritime jobs at the Port of Houston. This entry was posted in Achievement/Recognition, Career/technical education (CTE), College Readiness, News on January 31, 2019 by HISD Communications. Sterling Aviation High School is preparing its students for success beyond high school through a unique program that couples classroom instruction and real-world automotive work experience. In partnership with HISD’s Facilities Services and Fleet Operations, students from Sterling’s Automotive Technology program spend a full school year working alongside HISD employees, gaining valuable industry experience and becoming equipped to successfully enter the workforce upon graduation. This entry was posted in Business Operations, Career/technical education (CTE), District IV - Jolanda Jones, High Schools, Magnet/School Choice and tagged business operations, Facilities Services, Sterling HS on November 14, 2018 by HISD Communications. Are you a graduated senior interested in getting to work right away? Are you still trying to navigate your plans? HISD is offering an opportunity to explore high-paying careers in high-demand fields on Thursday, June 28 through BridgeYear. Session #2: 1 – 4 p.m. 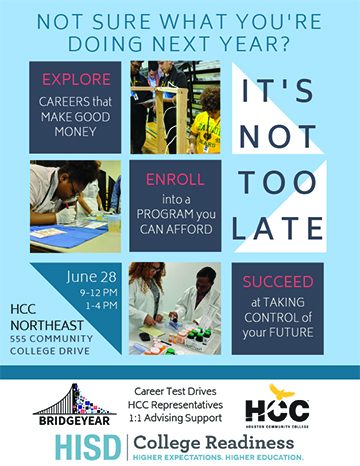 This entry was posted in Career/technical education (CTE), HISD: Our Story, News, Special events on June 25, 2018 by HISD Communications.